Slow cooker Beef and Broccoli with Rice is easy to throw together early on a busy day! When dinner time rolls around, turn on a pot of rice and dinner is ready. It’s a quick and easy meal everyone will love. Whenever we place an order for Chinese takeout, some type of beef and broccoli dish is included in the order. 1. The broccoli needs to still be an appealing shade of green. Not gray-green from over cooking! 3. The sauce needs to be not too thick, mostly salty, and a little bit sweet. 5. Not too many ingredients, I really want to enjoy the tender beef and crisp broccoli! There are hundreds of variations of this recipe online. I tried a few and came up with this version that I think is simple and tasty and pretty enough to serve guests. I also make a slow cooker take-out home made sweet and sour chicken dish along with this for a fun color and flavor contrast. If you only have one slow cooker (like most normal people), and want to make two slow cooker dishes at once, you can improvise by cooking one of the dishes in the oven on 275 for about 5-6 hours. Looking for a way to make this recipe a complete meal? Nothing goes better with Asian inspired dishes than rice. I love a good pot of sticky rice. If you don’t have a rice cooker, do yourself a favor and get one. I like to have a “keep warm” feature that allows me to make the rice ahead and keep the rice warm until ready to serve. There are lots of options out there when shopping for a rice cooker, I’m a fairly simple person, the warming feature is enough for me when looking for added bells and whistles! I also recommend Kukoho Rose or less expensive, but still acceptable, Cal Rose. The best place to buy rice is in an Asian market. Hope you enjoy this dish! Spray the inside of a slow cooker insert with cooking oil. Whisk together in the bowl of the slow cooker: beef broth or consume, soy sauce, Worcestershire sauce, brown sugar, sesame oil, garlic, ginger and pepper. Turn the slow cooker to low and place the meat into the slow cooker and stir to make sure all of the meat is coated with ingredients in bowl. Cover with lid and cook on low for 5-6 hours or until meat is tender. One hour before serving, cook rice and set aside. About 45 minutes before serving, sauté chopped onion in olive oil for 4-5 minutes on medium high until onions are soft. Add broccoli and cook until broccoli is bright green about 2 minutes, set pan aside. Remove about 1/2 to 1 cup of liquid from slow cooker and whisk in 3 tablespoons of cornstarch until smooth. Add the cornstarch mixture back to the slow cooker and let cook for about 20-30 minutes on low. Just before serving, add the onion and broccoli mixture to the slow cooker. -If you want to skip the step of sautéing the onions and broccoli, you can throw the chopped onion in with the beef. I found better results when cooking the onion separately. If the onions are cooked with the meat, the onions tend to water down the sauce quite a bit. You may also sauté the onion a day or two ahead and store in a ziplock bag in the fridge until ready to use. This looks wonderful! I love the slow cooker option. Since I’m allergic to broccoli, I’ll sub in sugar snap peas instead. Can’t wait to try this! Thanks! Peas would be a great substitute for broccoli! Let us know how it turns out! I’ve meant to tell you for months I did indeed make this with sugar snap peas. It was so yummy and your method worked just as well for the peas. Thanks! Thanks for letting me know! This has become one of our family favorites. So much better than takeout! Is the beef chuck roast already cooked? Hi Michelle, the beef is not already cooked, it cooks in the slow cooker. Hope you love this recipe! We made this last night and it was DELICIOUS! Husband and two kids gobbled it up. I accidentally missed slicing the meat before I put it into the slow cooker, but I just took it out and sliced it thin after it was done cooking and it still turned out great! Im glad you all loved it! I need to look at the directions again, another reader asked if the meat was added already cooked? The directions may be confusing? Ill check it out. thanks! Do you have any hints about slicing a roast for this? Yes, I slice the meat across the grain. It is the easiest and cleanest way to cut this type of meat! Also, freezing it for about 30 minutes helps. Made this last night and the entire family loved it. I added water chestnuts to the broccoli and onions. Yum! Thanks for sharing. Great addition Kimberley!I love water chestnuts. Thanks for reading ABK! Made this for dinner tonight and I am not kidding it is the best thing I have eaten in at least a month. So so delicious and easy. I will never be able to order Beef and Broccoli at a restaurant again! 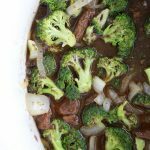 Could you make this beef and broccoli in the instant pot? If so, could you give me some instructions? Thanks Si! Your recipes are top notch! 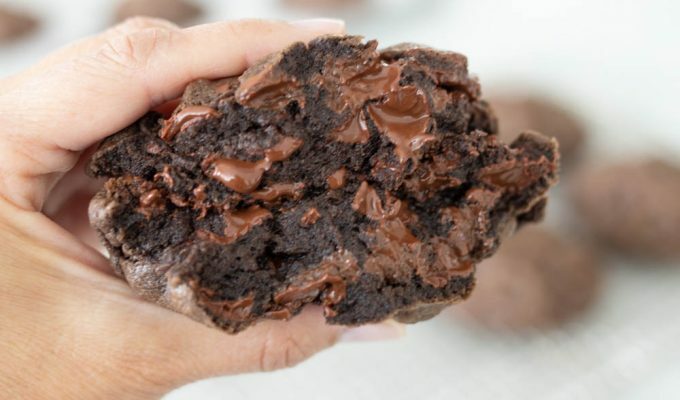 Is there a way this recipe could be cooked in the instant pot? Thanks Si…your recipes are top notch! I haven’t tried it, but Im guessing sautéing the beef and then adding rest of ingredients, except broccoli and cooking for about 30 minutes and then manual releasing the steam, and then adding the broccoli for another 5 minutes would work. You could also alternately steam the broccoli separately in the microwave and add it after the beef is cooked. I had beef and broccoli in the fridge and didn’t know what to make for dinner. I’m sooo glad I found this recipe. My son told me it’s the best dinner I have EVER made! He’s 22 by the way and has never really been impressed with any dishes that I experiment with. Well finally it has paid off, my partner thinks it’s amazing too! Thank you so much for making me look good 🙂 This dish will become a regular favourite. Oh and I cooked it in a Tagine for 5 hours. Hi Veronica, I’m sorry to hear you’re having issues with pinning it. It is also on my Pinterest page as well. I’ll see if I can figure out what’s the issue with that.